The soon-to-be completed search area, in purple and orange. I think it’s worth considering the logic behind this decision. Last year the ATSB spent months carefully calculating the boundaries of the original 60,000 sq km area. What they wound up with was a rectangle about 1200 km long and ranging in width from 48 to 62 kilometers wide, straddling the 7th arc. This area fit what the ATSB believed to be the most likely scenario for the final phase of the plane’s flight: that it flew straight on a southerly heading on autopilot and then shortly after 0:11 ran out of fuel — first one engine, then the second. After the second engine stopped, a backup system called the Auxiliary Power Unit (APU) would have kicked in, restoring a limited amount of electrical power. The plane’s satellite communications system would have rebooted, leading to the final “half ping” at 0:19. As soon as the second engine failed, the engine would have entered a unpowered glide, much as the “Miracle on the Hudson” A320 did after its engines ingested a flock of geese. In this case, however, there would have been no pilot at the controls to guide the plane in for a smooth landing. What’s more, the power interruption would have turned off the autopilot. Uncontrolled, the plane would have gradually banked into a turn, which then would have grown steeper, devolving into a tight spiral dive that would have ended with the plane impacting the water at high velocity. Let’s call this the “Unpiloted Fuel Exhaustion Scenario,” or UFES. … the 7th arc position calculation should assume that the aircraft was at or near sea level (the surface of the reference ellipsoid) at time 00:19:38, and hence only a little above sea level at 00:19:29, and descending rapidly. The fly in the ointment is that the search area described in the area is now almost completely scanned, and the plane is not inside it. 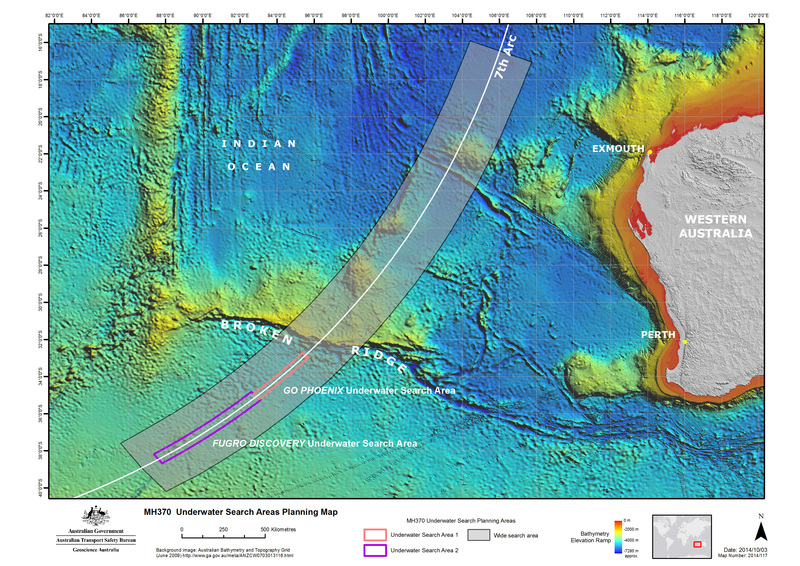 When the last square kilometer of the current 60,000 square kilometer search zone is scanned sometime next month, the hypothesis will have been falsified. The UFES will have been shown to be incorrect. 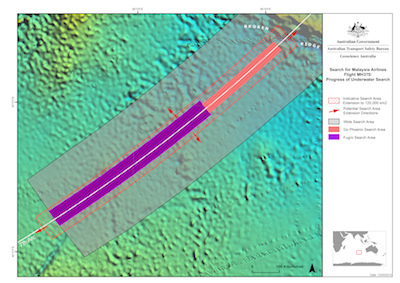 The failure to find the plane in the search area should not be regarded as failure. 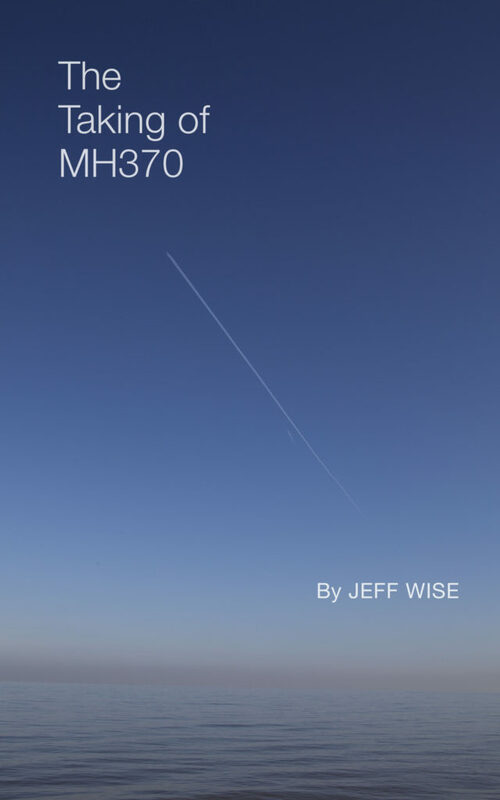 Rather, it is an important piece of information about the fate of MH370. It allows us to narrow down the list of possibilities going forward. But it does force us to confront a difficult question: How do we best rationally proceed? One approach would be to assess the different assumptions that underlie the UFES, judge which ones are most likely wrong, and then examine the available alternatives. Perhaps, for instance, the 0:19 half-ping was not caused by fuel exhaustion, but some other event. In that case, the plane might have flown on for an unknown period of further time. Perhaps aircraft performance calculations, which would rule out scenarios like that proposed by Simon Hardy, are incorrect and the plane really did fly far to the southwest. A fourth alternative is that, as I have suggested, the BFO data upon which the UFES is predicated cannot be trusted, because it was tampered with by sophisticated hijackers. Indeed, we know that the system that generates the BFO data was indeed tampered with, in a way that implies sophisticated knowledge by whoever carried it out. If such a spoof were carried out, then the plane would likely be many thousands of miles from the southern Indian Ocean—most likely, in Kazakhstan. That scenario would explain why no debris has been found in the southern Indian Ocean, and provide a link to what would otherwise be an extremely unlikely coincidence: the Russian shoot-down of a second Malaysian Airlines 777 just four months later. The ATSB has as yet given no indication that they realize that the the UFES is incorrect, or what kind of scenario would be compatible with the new search area. They have specifically stated that they view the Kazakhstan scenario as impossible, but have not revealed any evidence that would rule out a spoof. Perhaps the time has come for the taxpayers funding the SIO search to demand a more rational approach. UPDATE: Soon after I put up this post, one reader commented via Twitter that continuing to search the southern Indian Ocean at least provided jobs and did no actual harm. I disagree. Apart from spending taxpayers’ money unnecessarily, it serves to put the mystery of MH370 on ice–allowing the authorities can say “we’re doing the best we can” while running out the clock on the public’s interest in the case. They’re buying the right to pretend, for one more year, that their assurances haven’t been empty and that the UFES is still a reasonable (indeed, the only reasonable) possibility. This means that more profitable lines of inquiry will continue to be ignored. Your graph assumes 210 metric tons as a starting weight. I don’t know where you got that figure. At 17:07 the actual weight was 218.4 metric tons. I don’t know where you got the weight of 218.4 metric tons. At 17:07 the reported fuel on board was 43,800 kg, added to the zero fuel weight of 174,369 kg gives a weight of 218,169 metric tons. My graph starts at a somewhat arbitrary weight close to the last primary radar location. If you want to start at 17:07, maintaining FL350 to a weight of 210 metric tons, just add 607 NM and 1,265 hours, then add or subtract a few miles and minutes for the extra fuel saved or lost during descent or climb to the various FL’s. It may be useful to indicate a point on the graph at FL350, 5.867 h, which is the time from a weight of 210 ton to 00:15 UTC, assuming flight at FL350 from 17:07 to 00:15. Also bear in mind that the graph is for LRC at nominal (FCOM) performance, wheras the ATSB Update performance boundary is for MRC, possibly including some performance adjustment for the particular airplane. I’ve read with interest all IG papers being published on Duncan Steel’s site. Without a comment venue there, I’m not sure where best to ask questions. There’s a very good chance I’m misreading your report’s main body, but I can’t find a way to draw anything but the OPPOSITE conclusion from test 6a: standard deviation of latitude: 7.1 nmi; of longitude: 2.5 nmi. Did the conclusion simply contain a typo? Chris – yes I did stumble onto that. If I’m right there is a lot of recycled stuff but notably someone does stick their neck out to claim it is possible to sail north with no transponder, get seen, and not be challenged. The readers of this blog seem to have missed the point of the graph I posted on May 11. Therefore it may be useful to add some background. The FCOM LRC Control table shows the fuel flows for the tabulated weights and altitudes. Fuel flow is equal to the change of airplane weight per unit of time. The table therefore defines the variation of weight versus time. That variation depends only on the altitude, and is independent of wind, the path of the airplane, and the timing of the turn towards the south. Therefore the fuel remaining at 00:11 UTC, and the distance between 00:11 and the time of fuel exhaustion, is only dependent on altitude, but is not affected by the timing of the turn south. Although Brock McEwen’s argument of “rotational symmetry” is essentially correct, it is actually irrelevant to the point he is trying to make, that the distance between 00:11 and fuel exhaustion shown in figure 2 is different from that in figure 3 in the ATSB’s Update of October 8, 2014. Since the reason for that difference is not evident, an explanation from the ATSB would be most welcome. 1. You and I agree 100% on the basic principle that, for a given constant-speed, constant altitude, performance limit-generating path, the amount by which that path exceeds the 00:11 (or 00:19) arc is UNNAFFECTED by FMT timing. 2. The principle of rotational symmetry – irrelevant to 1. above, yes – is useful in determining precisely WHERE on the 00:11 (or 00:19) arc the (missing) FL400 path should have been plotted in Fig.2 – because FMT timing most certainly DOES affect that. Agree 100% the ATSB has some explaining to do. On this topic, and others. I don’t disagree with your #2, but the location of the FL400 path wasn’t in dispute, just the length of it. @Gysbrecht: if there is no dispute among us re: POSITION, then you agree with me that the FL400 path ending at E88 under an 18:40 FMT (Fig.3) PROVES (by the principle of rotational symmetry (patent pending)) that the missing FL400 path in Fig.2 should have ended at E84. If you think it should end anywhere else, I’ll just have to refer you back to the report. I’m sensing a potential merry-go-round, here. Yeah you’re right. Recycled…when I saw it was only 12 hours old, I posted then viewed it. Disappointing…..Didn’t think the BBC would invest in a complete re-run. The precise position depends on the details you have neglected. Otherwise I agree. Just a tiny point, the documentary is from the Channel 5 (UK) stable, not the BBC. Note the ‘5’ in the top left corner. It looks indeed mostly recycled from a documentary last year, titled “Flight MH370; 119 Days & Counting”. Better than nothing, I suppose! One would suppose that you could trust the title “Disappearance Of Malaysia Airlines – BBC Documentary 2015” I did notice the “5” when reviewing it for a bit. Just received the news Lewisville, TX 5:09 AM. BB King has died. Another thrill & legend is gone. Some in British media-land might say that there more than a tiny difference between Channel 5 (an historically low-cost operation now owned by the US Viacom) and the BBC (the UK broadcaster of record etc. etc. ).